← Pre-order The Skiff Guard 3-Pack From EE! Coming This July! Pre-order TVC Gamorrean Guard (VC21) At Entertainment Earth! Pre-order the TVC Gamorrean Guard from Entertainment Earth! It’s arriving in May! New/Re-released TVC Gamorrean Guard Comparison Shot! JTA reader and friend Josh M. took some time to compile the three “vintage Kenner” Gamorran Guard figures side by side for a comparison shot, including the brand new re-released Gamorrean Guard from “TVC2.” Thank goodness I have the original! Foreign language sullies the re-released figure’s name pill. But of note, there are some critical card back changes made to the coloring and style of the packaging. Check it out! You’d think a person of this unscrupulous character would just wait for these things to go on clearance. Hasbro treated the Gamorrean Guard 6″ figure right and made plenty of them for everyone. If you don’t want to pay $30 for it, then buy it when it is 50% off. Don’t steal. Are You Having Success Finding The TBS6 [P3] Gamorrean Guard? If you’re a The Black Series 6″ collector, have you had any luck recently securing the Gamorrean Guard at retails. With inaccurate Brickseek stock alerts and store orders filling online orders, it’s incredible that any of us have found anything at all. We have recently received new store reports of the figures on shelves, but many more of us have never seen it once. Let us know your experiences with this figure. We’re curious to know if you’ve had great success or not. I have also heard a rumor that what is out there is out there and that a re-order would need to take place for more to arrive. I cannot substantiate that rumor at all, however. The plot thickens/drama intensifies with The Black Series [Phase III] 6″ Gamorrean Guard. Now we’re getting reports of people who successfully ordered the item online when it was in stock AND WHO DID NOT choose store pick-up that are currently receiving cancellation notices from TARGET online. We have no idea how widespread this is or how many collectors it’s affected, but it’s annoying nonetheless. We wish you continued luck in your online experience ordering this underestimated exclusive. You can stuff your sorries in a sack, TARGET! We suppose it was inevitable, but TARGET is once again sending out “sorry for the delay” emails for The Black Series [Phase III] 6″ Gamorrean Guard 6″ figure, now stating that the earliest they may be able to fill the order is mid-September. What’s more, the email advises that you may need to “approve” this new delivery date. So pay attention to your inbox! It’s always good to double your production on the most popular army-building OT characters. Just sayin’. JTA reader Vincent B. didn’t have the best experience with regards to the TARGET exclusive Gamorrean Guard figure. Click through for his story. A Ton Of New Gamorrean Guard Store Reports! 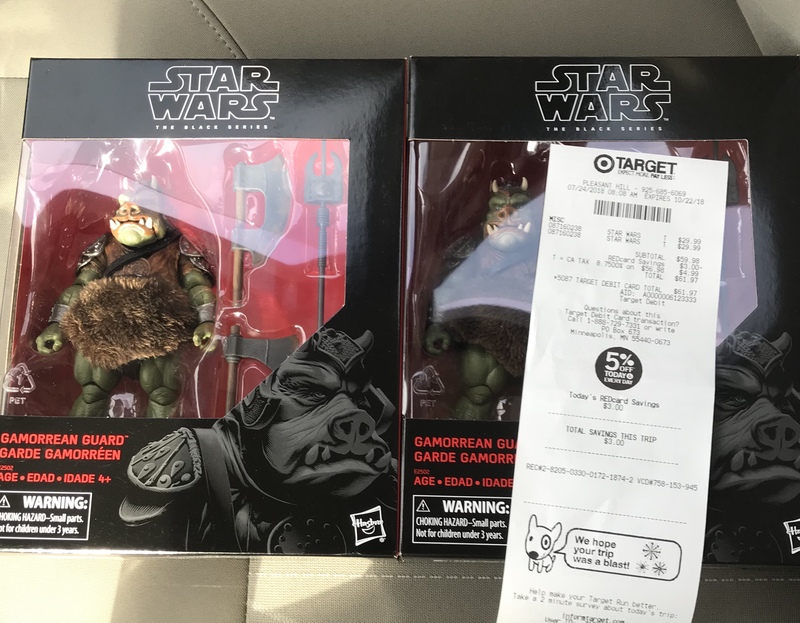 Out of nowhere, MULTIPLE TARGET stores across the country are receiving more Gamorrean Guard figures. Brickseek lies! (That’s a joke.) We have new reports from NJ, VA, NH, and NC and we imagine more will come in when the rest of the country opens up shop. Stores that showed no inventory last night had them on shelves this morning. Let the insanity begin! Thanks to all who wrote in with reports! Images below are from JTA reader Dana S. S.
← Will Hasbro Get Out The Highly Sought-After Guards Needed For The Barge? Is The Gamorrean Guard The Pig That Broke The Camel's Back? Is The Black Series [Phase III] Gamorrean Guard 6″ figure the one that broke the camel’s back for many collectors? If you read some of our comments in the previous article, you might believe it’s the case. This experience has forced some collectors out wholly. The Gamorrean Guard was up for order longer than expected. But those who chose their local store pick-up option were greeted with cancellation emails. As you may know, TARGET using store stock to fulfill these orders, but the figures were already long gone by this point. Also, customers were given ridiculous stories by TARGET staff that they couldn’t get to the figures, that they couldn’t find them, or and that they would be out on Sunday with a new reset. These customers came back, and the figures were gone (each store only received four on average initially). Then those who ordered for home delivery received emails that their items were on back order with no approximated availability date. Later others received an email that this item will be delayed until August 20th (which isn’t the worst news of course). An Original Trilogy army-building character with the popularity of the Gamorrean Guard should have been produced in triplicate to all previous store exclusives. It shouldn’t have even been a store exclusive. But what do we know? Anyway, let us know of your trials and tribulations securing this highly sought-after figure, and we hope that many of you can report better news than the reports we’re getting. Click through to see some of the correspondence readers are receiving. If you have cancellation emails, please post them in the comments too! HURRY! The Black Series [Phase III] Gamorrean Guard Is IN STOCK! Are you ready to PIG OUT!? The Black Series [Phase III] Gamorrean Guard 6″ figure is IN STOCK! RIGHT NOW! Special thanks to friend and JTA reader Russ T. and JTA reader Sam C. for the alerts! Good luck! It seems as if there is no limit at TARGET.com. As always, check out our full review on this beautiful figure HERE! UPDATE: It’s “temporarily” out of stock. Keep checking! The highly anticipated Gamorrean Guard 6″ figure is starting to hit Target brick & mortar. JTA reader Eric found his in Pleasant Hill, CA. Let us know in the comments if you are finding this in your area! Is The Gamorrean Guard Getting Repacked In The Vintage Collection? StarWars.com has updated their site to reflect on the reveals at SDCC this year. In their write up thye mention that the Gamorrean Guard is forthcoming in The Vintage Collection. A mistake and they meant the Elite Praetorian Guard, or is the Gamorrean Guard one of the next repacks that the line desperately needs? Check it out. Special thanks to all who wrote in to alert us. TARGET.com TBS6 [P3] Gamorrean Guard Available Soon! Are you ready? The Black Series [Phase III] Gamorrean Guard 6″ figure is nearly ready to go live at TARGET.com. They’ve updated their product page, and the current status is “temporarily out of stock.” Good luck to all who want it! Check out our full review on this beautiful figure HERE! We have an early look at the amazing The Black Series [Phase III] 6-Inch Target exclusive Gamorrean Guard, tonight’s Visual Guide Update. Click below to check out our fully detailed Visual Guide, and be sure to check out extensive details and discussion on this figure in our full review. And here is the full review of The Black Series [Phase III] Gamorrean Guard 6″ figure. Learn everything you want to know about it in our Research Droids Reviews today! Be sure to leave your thoughts in our comments section, vote in the poll or even comment about it on our Facebook page. Click the banner below for the direct link to the review! As always, you can also send your review requests via email if you’d like to see something that we didn’t cover yet. First Look! The Black Series [Phase III] 6" Gamorrean Guard Is DIVINE! Well, here it is folks. 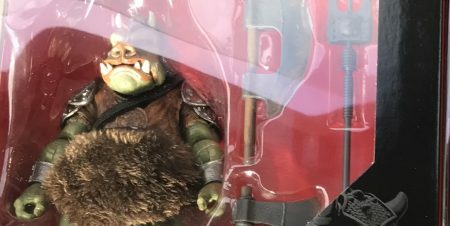 The glamorous Gamorrean Guard from The Black Series [Phase III] line is here, and we have a sneak first look peek at him for you. The figure is eerily similar to The Vintage Collection Gamorrean Guard (VC21) figure in that it’s not 100% perfection, but you’re not going to care. The Gamorrean Guard hits all of the sweet spots you’d expect from a premium Star Wars collectible. The paint operations are generally excellent, although he has a weird brown stripe going up his snout. Hasbro did an excellent job on the fine paint details on the figure face because they cannot utilize “photorealistic” technology on aliens as explained. The helmet is NOT removable. But this is a good thing. It stays in place as required and helps when displaying him in your collection. The soft-goods skirt is silky and luxurious. It’s an incredible fabric they’ve utilized, and you’re going to love it too. The Gamorrean Guard comes with a hinge-jointed lower jaw which is nice, but unnecessary. Just like the Admiral Ackbar figure before him, the combination of a ball-socket head with a hinge-jointed jaw severely inhibits the head movement. His “groin area” is a bit hollow. I know that sounds strange, but you’ll have to see it for yourself to understand what I mean. It feels a tad cheap, honestly. The rest of the figure and its articulation are divine. Check out our sneak peek now and be sure to come back soon for the full review! Green With Envy And Ham: TVC Gamorrean Guard Still Commands A Premium! And speaking of the Gamorrean Guard, have any of you checked out the asking prices for recent live eBay auctions for The Vintage Collection figure? They’re quite accurate. You can confirm this yourself by checking out the SOLD LISTINGS in the advanced search function. It’s hard to believe that this beautiful 3.75″ super-articulated figure is going for more than The Black Series [Phase III] 6″ version! The figure was available in over a dozen case assortments throughout The Vintage Collection’s original run. The TVC Gamorrean Guard (VC21) figure has been a source of frustration for TVC collectors for years, and it appears the frustration is only going to get worse. No other figure from this line is as desired as this one is. It makes people green with envy, especially when they see collectors with more than one of them! ← BREAKING NEWS! Walmart Exclusive TVC Rey (Island Journey) Hits eBay! If you have zero patience like the average, normal Star Wars collector, foreign sellers have both The Black Series [Phase III] Gamorrean Guard and Clone Commander Wolffe in-hand as well.